Holidays are all about giving and sharing; about spending time with family and friends; about surprising them with perfectly wrapped presents they’ve been wishing for the entire year. For brands, holidays are the billion-dollar season. Everyone’s browsing the web and skimming through newsfeed on different social platforms in search for ideal gifts. 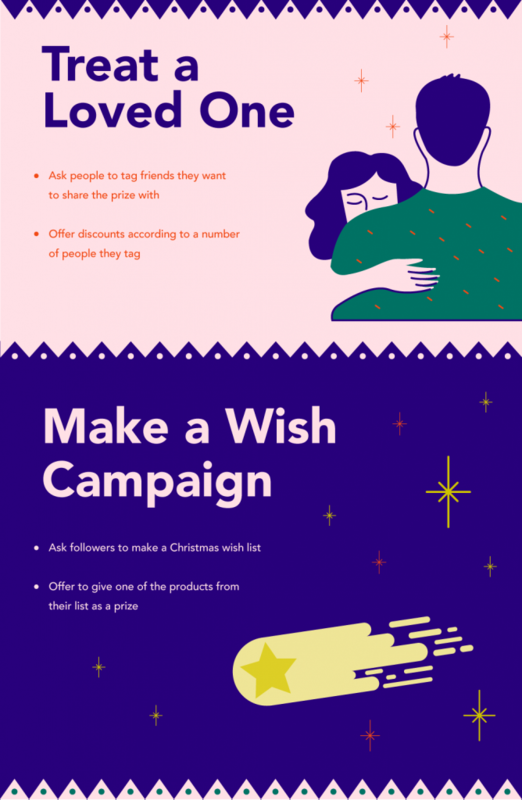 But with growing competition and an increasing number of brands investing in creative advertising campaigns, it requires an immense amount of creativity to craft a giveaway holiday campaign that will stand out. A giveaway is a blanket term used for any marketing campaign within which free merchandise is offered to potential or existing customers. To enter the giveaway, participants are required to give their personal information. Now, although statistics show that people are willing to share their personal info for rewards, note that it has to be a good one; a carefully defined award that will appeal to consumers enough to motivate them to enter the competition and share it with their friends on different social media platforms. Depending on a gender, age, location, and other data you collect, it becomes easy to clearly define a target persona to which your brand is looking to appeal. As a result, you’ll be able to decide on the best possible prize and conduct better targeting. Advertising the giveaway on social media enables you to create the buzz in a short amount of time, growing your potential customer pool with minimal investment. With every share, like, and a comment you are one step closer to getting an engaged person to convert. You also grow a cloud of positive feedback around the giveaway and the brand. In the upcoming months, we are about to see a bloody battle in an online arena, with brands fighting for their target audience’s attention. Here are a few ideas from our arsenal you can use to design the giveaway that will make you the winning brand. Want to really get to know your target audience? Create a unique quiz where they will not have to show their knowledge on a specific subject but will be required to answer questions about themselves and their holiday wishes. Ask them how they like to spend their free time, which books/movies they like to watch, is there anything they always wanted but never got around to buying, what is the Christmas present they secretly hope for, etc. At the end the quiz, you will provide them with a code with which they enter the giveaway and compete for the secret prize. As you receive their answers, you familiarize with their needs and get a better idea of what could surprise them the most. Why stop at gifting just one person? Create a holiday contest where you will ask your followers to tag a loved one or two they would like to share the prize with. To incentivize people to enter the giveaway and tag as many friends as possible, you could offer discounts depending on the number of tags (10% for one friend, 25% for 3 friends, etc.) This will aid you in expanding your reach and appealing to wider audience. This one could be a winner around Christmas – everyone had a Santa list when they were younger, but as we grew older, an illusion of a friendly wrinkly face gifting us for being good the entire year was shattered. Play on those emotions and ask your followers to list the products they would like to receive as the contest prize. You’ll get to promote your products, and someone will get a Christmas gift they really want. 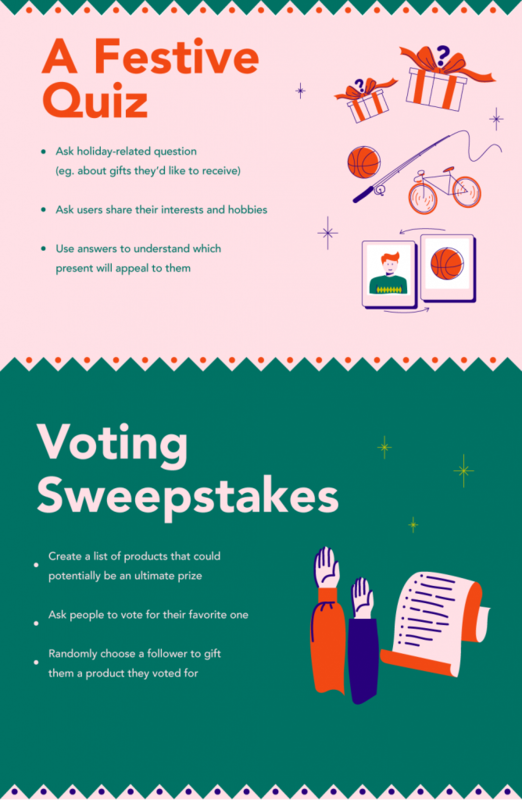 Alternatively, you can be the one to create a list of products that could be a potential giveaway prize and create a poll. Ask your followers to vote on the product that appeals to them the most and leave a comment on why they prefer that particular product over all others. This will provide you with additional feedback to see which items perform best with your consumers and who knows – you might even get some ideas on how to adjust or expand your product offer next year. Holidays are a season of giving to those who can never treat themselves. Recognize consumers’ compassion and run a giveaway that will benefit a much greater cause. Ask participants to name the charity they feel would benefit the most from your help and make a donation in the name of the person who suggested it. There truly is no better way to give back to the community and grow your reputation as a brand that’s looking beyond profit. Snowflakes piling up on a window sill, fire burning in the fireplace, a marshmallow soaking in hot cocoa, and an entire family gathered around the Christmas tree, adding decorations one by one in an effort to make it more beautiful than ever before. Once all is finished, everyone wants to take a picture and share it with the world, because everybody thinks their Christmas tree is better than anyone else’s. Take this opportunity to ask your customers to enter your holiday contest by sharing photos of their decorations, and ultimately get awarded with one of your products! Trigger nostalgia: ask giveaway participant to think of their childhood, the exciting time when they sat below the Christmas tree, writing their letter to Santa saying how good they were the entire year, listing their Christmas wishes. Ask them to write a letter to you, explaining why they are the ones who should win the prize and award the most creative ones. 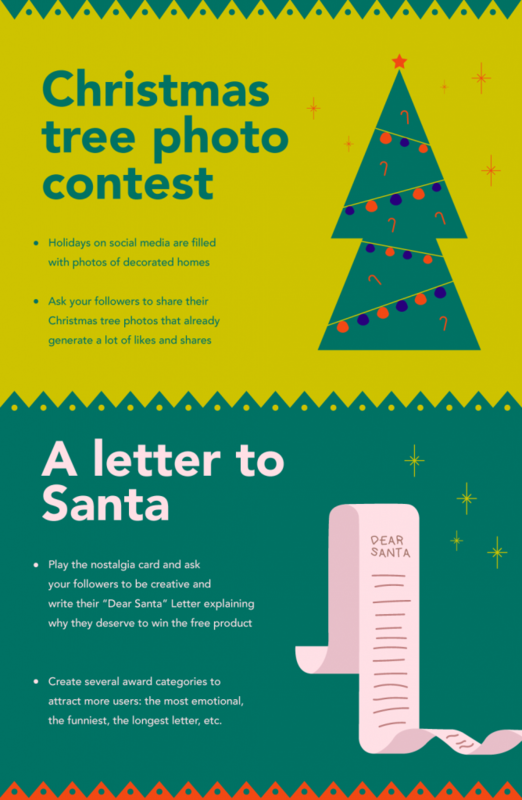 You can even create several categories, like the funniest, the most emotional, or longest and most creative Dear Santa letter, and motivate a greater number of people to participate. Contest and promotions are best to be run during the holiday season, when people are in the mood for shopping – for others and themselves. Although they’ve probably been saving for some time to be able to afford the perfect gift, they are bound to appreciate a discount or a freebie. If you were ever to test a giveaway campaign, now is the time.